Washburn General Store began business about 1831. As was the practice of the day, the General Store sold coffins, coffin hardware and related funeral merchandise to the community. We think that the actual funeral home portion began around 1926. E.N. Washburn was the first generation Funeral Director for the business. In 1945, his son Edward began assisting him with the business. Edward became a licensed Funeral Director in 1957. By the late 60's, E.N. 's health had declined to point where he could no longer be fully active in the business. Edward and Catherine assumed full ownership of the firm. E.N. died in 1971. Services and visitations were held in the historic Washburn home. The buiding next to the general store housed the arrangement room, an office and embalming room. 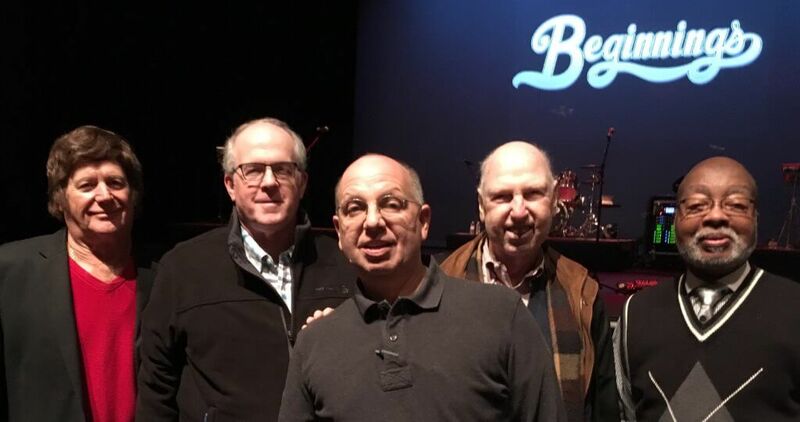 January 2017 was the time for a reunion of the early 1980's airstaff of WXIK K-96 Shelby, at the Beginnings concert at ICC. Left to right: Stan "J. Worthington" Smith, Andy Foster, Kent Dorsey, Jeffrey Owens, Eddie Bridges. Sadly, we lost Jeffrey Owens on November 23, 2017 to cancer. One of the best bosses I have ever had, he will be greatly missed by radio folks, piano tuners, and his dear family.